Find out more at Corona. NO PRODUCT PURCHASE NECESSARY TO ENTER THE SWEEPSTAKES. 1. PROMOTION PERIOD: The Corona Holiday 2017 Sweepstakes (the “Sweepstakes”) begins at 12:00 AM Eastern Time (“ET”) on November 3, 2017 and ends at 11:59 PM ET on December 31, 2017 (the “Promotion Period”). The Promotion Period consists of nine (9) weekly entry periods (each an “Entry Period”). Each Entry Period begins at 12:00 AM ET each Sunday during the Promotion Period and ends at 11:59 PM ET each Saturday during the Promotion Period, with the exception of the first Entry Period which begins at 12:00 AM ET on Friday, November 3, 2017, and the last Entry Period which ends at 11:59 PM ET on Sunday, December 31, 2017. See chart below in Rule #4 for details. 2. ELIGIBILITY: The Sweepstakes is open only to legal residents of the fifty (50) United States and the District of Columbia, who are 21 years of age or older as of date of entry. Employees of Crown Imports LLC (“Sponsor”), Shazam Media Services, Don Jagoda Associates, Inc. (“Administrator”), their respective parents, subsidiaries, divisions, affiliates, suppliers, distributors and advertising, promotional and judging agencies (collectively, “Released Parties”), retailers of alcohol products, and their immediate family members (spouses, domestic partners, parents, children, and siblings) and household members of each (whether related or not) are not eligible to participate or win. Void where prohibited by law. All federal, state and local laws and regulations apply. A. During the Promotion Period, look for special Sweepstakes displays (each a “Display”) at participating retailers. 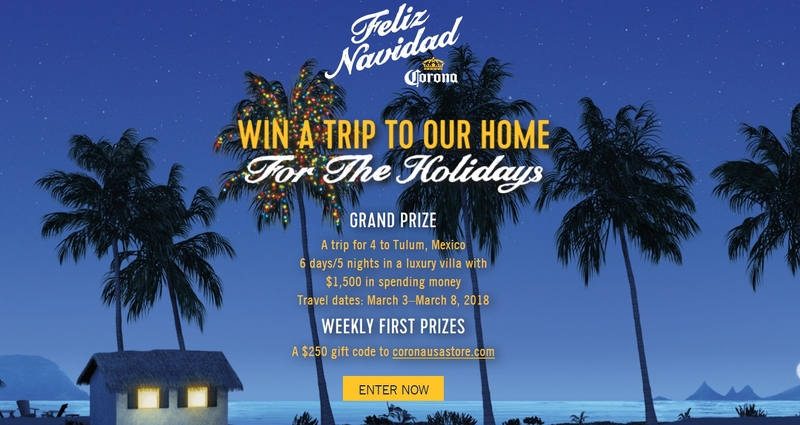 Using the Shazam application (“app”) on your web-enabled mobile device, tap the camera icon and scan the image of the Corona Extra or Corona Light bottle shown on the Display or the special Shazam logo (with the image of a camera) shown on the Display, to be redirected to the Corona Holiday 2017 Sweepstakes Website (“Website”). B. During the Promotion Period, watch for Corona’s “Feliz Navidad” holiday-themed television commercial (“Commercial”). Using the Shazam app on your web-enabled mobile device, tap the Shazam icon and scan the song played during the Commercial to be redirected to the Website. C. During the Promotion Period, using the Shazam app on your web-enabled mobile device, tap the camera icon and scan an actual Corona Extra or Corona Light bottle or any image of a Corona Extra or Corona Light bottle, to be redirected to the Website. D. During the Promotion Period, look for Sweepstakes posts (each a “Post”) from Corona and/or Corona Light on Instagram and/or Facebook. Click on the link in a Post to be redirected to the Website. After completing any of the actions described above to be redirected to the Website, follow the instructions on the Website to complete the Sweepstakes Registration Form (“Form”), and submit your entry into the Sweepstakes (“Entry”). If you do not have the Shazam app, you can download it for free at www.shazam.com/apps. Subject to Shazam Terms and Conditions at https://www.shazam.com/terms#top. If you do not have an Instagram account, you can open one for free by downloading the Instagram application from the Apple store or Google Play. If you do not have a Facebook account, visit www.Facebook.com to create a free account. Entries must be received by the Entry Deadline indicated in the chart below in Rule #4, to be included in that Entry Period’s drawing and any subsequent Entry Periods’ drawings and the Grand Prize drawing. Entries must be received by 11:59 PM ET on December 31, 2017 to be included in the last Entry Period drawing and the Grand Prize drawing. Multiple entrants are not permitted to share the same email address to submit an Entry. Limit one (1) Entry per person/email address per Entry Period. 4. WEEKLY RANDOM DRAWINGS: At the end of each Entry Period, two (2) First Prize winners will be randomly selected by Administrator, on or about the following Friday after each Entry Deadline indicated in the chart below, from among all eligible Entries received by the end of that Entry Period. Random drawings will be conducted by Administrator, an independent judging organization whose decisions are final on all matters relating to the Sweepstakes. The odds of winning a First Prize will depend on the total number of eligible Entries received by the end of each Entry Period. Limit one (1) First Prize per person/email address/household. 5. GRAND PRIZE RANDOM DRAWING: The Grand Prize winner will be randomly selected by Administrator, on or about January 3, 2018, from among all eligible Entries received throughout the Promotion Period. Grand Prize random drawing will be conducted by Administrator, an independent judging organization whose decisions are final on all matters relating to the Sweepstakes. The odds of winning the Grand Prize will depend on the total number of eligible Entries received throughout the Promotion Period. 6. WINNER NOTIFICATION: Potential winners will be notified by phone/email. Potential Grand Prize winners will be required to complete and return via email/fax/mail, an Affidavit of Eligibility, Release of Liability and, if legally permissible, a Publicity Release and assignment of rights within three (3) days of Administrator’s attempted delivery of same. Noncompliance within any specified time period or return of any prize/prize notification as undeliverable, or declining the prize for any reason, will result in disqualification without further notice and an alternate winner may be selected. 7. PRIZES & APPROXIMATE RETAIL VALUES (“ARVs”): All nineteen (19) prizes, with a total ARV of $21,000, are available to be won as follows: One (1) Grand Prize: A six (6)-day/five (5)-night trip for winner and up to three (3) travel companions to Tulum, Mexico (departing 3/3/18; returning 3/8/18). Trip includes round-trip coach air transportation from major airport nearest winner’s home, five (5) nights’ hotel accommodations (two rooms, double occupancy), ground transportation from/to airport/hotel and $1,500 spending money (awarded in the form of a check to winner) (ARV $16,500). Winner’s travel companions must be 21 years or older at time of travel and must execute and return a liability/publicity release prior to travel. Winner and travel companions are solely responsible for all other expenses not specifically set forth herein, including but not limited to meals, additional transportation, souvenirs, upgraded room accommodations and other incidentals and items of a personal nature. Sponsor is not responsible for lost, mutilated or stolen travel documents. Actual retail value of the prize will depend on winner’s point of departure/return. Grand Prize Winner and his/her travel companions must travel on same itinerary. Trip must be taken on dates specified by Sponsor; dates of departure/return are subject to change at Sponsor’s discretion. Travel is subject to availability and certain restrictions may apply. All travelers must have valid passport and additional travel documents prior to departure. In the event Grand Prize winner or travel companions engage in behavior that (as determined by Sponsor in Sponsor’s sole discretion) is inappropriate or threatening, illegal or that is intended to annoy, abuse, threaten or harass any other person, Sponsor reserves the right to terminate the trip early, in whole or in part, and send the Grand Prize winner and travel companions home with no further compensation to the Grand Prize winner. In the event Grand Prize winner or his/her travel companions consume alcoholic beverages (not provided by Sponsor) while participating in any Grand Prize-related activities, they do so at their own discretion and agree to hold Sponsor and its agencies harmless from any subsequent damages or third-party claims arising out of or related to such consumption. Eighteen (18) First Prizes (2 per Entry Period) – A $250 digital gift card redeemable for merchandise at The Corona Store at www.amazon.com. No alcohol is included with any prize. 8. GENERAL RULES: Any federal, state, and local taxes are solely the responsibility of the winners, if applicable. No transfer, assignment, substitution or cash equivalent for a prize will be permitted, except at the sole discretion of the Sponsor due to prize unavailability for any reason. In such circumstance, an alternate prize of equal value will be awarded and Sponsor’s obligation to the winner will be fulfilled, and no other additional compensation will be provided. The Released Parties assume no responsibility or liability for damages, losses or injury resulting from acceptance or use of a prize. In no event will more than the stated number of prizes be awarded. If an entrant submits more than the stated number of permitted Entries and/or if Sponsor suspects that an entrant attempted to obtain additional Entries by using multiple/different email addresses, identities, registrations or logins, or any other methods, will void that entrant’s Entries and that entrant may be disqualified. Normal internet access and data charges imposed by your internet/wireless phone service provider may apply. See your internet/wireless provider for pricing plan details. Entries generated by script, macro or other automated means and Entries by any means which subvert the Entry process are void. Entries will not be acknowledged or returned. Sponsor is not responsible for lost, late, incomplete, invalid, unintelligible or misdirected Entries, which will be disqualified. Any use of robotic, repetitive, automatic, programmed or similar Entry methods or agents (including, but not limited to, sweepstakes Entry services to create fraudulent email addresses, Shazam accounts and/or identities) will void all Entries by that entrant. In the event of a dispute as to any Entry, the authorized account holder of the email address indicated on the Entry will be deemed to be the entrant. “Authorized email account holder” is defined as the natural person who is assigned to an email address by an Internet access provider, online service provider or other organization (e.g., business, educational institution, etc.) that is responsible for assigning email addresses for the domain associated with the submitted email address. Potential winners may be required to show proof of being the authorized account holders associated with the Entries. Entrants/winners/travel companions agree to release, discharge and hold harmless Released Parties, Facebook and Instagram, from and against any and all liability (including damages caused or claimed to be caused) arising out of participation and/or acceptance/use of a prize, and agree to be bound by the Official Rules and the judges’ decisions, which are final. Acceptance of a prize constitutes permission for the Sponsor and its agencies to use winners’ names and/or likenesses and Entries for purposes of advertising and trade without further compensation, including a winners list, unless prohibited by law. In the event there is a discrepancy or inconsistency between disclosures or other statements contained in any Sweepstakes materials and the terms and conditions of the Official Rules, the English version of the Official Rules shall prevail, govern and control. The Released Parties are not responsible for any typographical or other error in the printing of the Sweepstakes, administration of the Sweepstakes or in the announcement of the prizes. NOTICE: ANY ATTEMPT BY AN INDIVIDUAL TO DELIBERATELY DAMAGE ANY WEB SITE OR UNDERMINE THE LEGITIMATE OPERATION OF THIS PROMOTION IS A VIOLATION OF CRIMINAL AND CIVIL LAWS, AND SHOULD SUCH AN ATTEMPT BE MADE, SPONSOR RESERVES THE RIGHT TO SEEK DAMAGES FROM ANY SUCH INDIVIDUAL TO THE FULLEST EXTENT PERMITTED BY LAW. The Released Parties are not responsible for faulty, incorrect, undeliverable or mistranscribed phone/email transmissions, incorrect announcements of any kind, technical hardware or software failures of any kind including any injury or damage to any person’s computer, phone or device related to or resulting from participating in or experiencing any materials in connection with the Sweepstakes, lost or unavailable network connections, or failed, incomplete, garbled or delayed computer/device transmission that may limit a user’s ability to participate in the Sweepstakes. All entrants understand and agree that all rights under Section 1542 of the Civil Code of California (“Section 1542”) and any similar law of any state, territory, or country that may be applicable with respect to the foregoing release are hereby expressly and forever waived. All participating entrants acknowledge that Section 1542 provides that: “A GENERAL RELEASE DOES NOT EXTEND TO CLAIMS WHICH THE CREDITOR DOES NOT KNOW OR SUSPECT TO EXIST IN HIS OR HER FAVOR AT THE TIME OF EXECUTING THE RELEASE, WHICH, IF KNOWN BY HIM OR HER MUST HAVE MATERIALLY AFFECTED HIS OR HER SETTLEMENT WITH THE DEBTOR.” The releases hereunder are intended to apply to all claims not known or suspected to exist with the intent of waiving the effect of laws requiring the intent to release future unknown claims. The Released Parties assume no responsibility for undeliverable emails resulting from any form of active or passive email filtering by a user’s Internet service provider and/or email client or for insufficient space in user’s email account to receive email. Sponsor reserves the right to cancel or modify the Sweepstakes if fraud, misconduct or technical failures threaten the integrity of the Sweepstakes; or if a computer virus, bug, or other technical problem corrupts the administration or security of the Sweepstakes as determined by Sponsor/Administrator, in their sole discretion. In the event of termination, a notice will be posted online and the drawings for all prizes will be conducted from among all eligible Entries received by each Entry Period and overall prior to termination. Any damage made to the Website by an entrant will be the responsibility of the entrant and/or the authorized email account holder of the email address submitted at the time of Entry. Sponsor reserves the right to prohibit the participation of an individual if fraud or tampering is suspected or if the individual fails to comply with any requirement of participation as stated herein or with any provision in these Official Rules. 9. DISPUTES: THIS SWEEPSTAKES IS GOVERNED BY THE LAWS OF THE UNITED STATES AND THE STATE OF ILLINOIS, WITHOUT RESPECT TO CONFLICT OF LAW DOCTRINES. As a condition of participating in this Sweepstakes, each entrant agrees that any and all disputes that cannot be resolved between the parties, and all causes of action arising out of or connected with this Sweepstakes, shall be resolved individually without resort to any form of class action and exclusively before a court having jurisdiction located in Cook County, Illinois. In any such dispute, under no circumstances will entrant be permitted to obtain awards for, and hereby waives all rights to claim, punitive, incidental or consequential damages, including reasonable attorneys’ fees, other than entrant’s actual out-of-pocket expenses (e.g., evidenced costs associated with entering this Sweepstakes). Entrant further waives all rights to have damages multiplied or increased. 11. WINNERS LIST: For the names of winners, send a stamped, self-addressed envelope by March 1, 2018, to: Corona Holiday 2017 Sweepstakes Winners, Dept. VZ, 100 Marcus Drive, Melville, NY 11747. 12. SPONSOR: Crown Imports LLC, One South Dearborn Street, Chicago, IL 60603. 13. ADMINISTRATOR: Don Jagoda Associates, Inc., 100 Marcus Drive, Melville, NY 11747.